Monson: Who’s better? Utah’s Jason Shelley or BYU’s Zach Wilson? Freshmen quarterbacks face off in their first rivalry game. 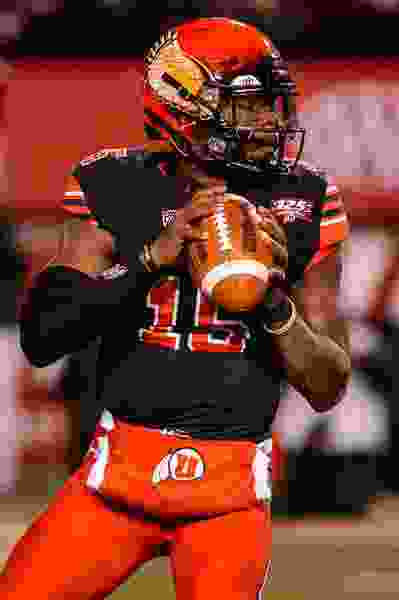 (Trent Nelson | The Salt Lake Tribune) Utah Utes quarterback Jason Shelley (15). Utah Utes host the Oregon Ducks, NCAA football at Rice-Eccles Stadium in Salt Lake City on Saturday Nov. 10, 2018. They are young. They are inexperienced. They are talented in a yet-to-be-determined way. They are green, tenderfoot quarterbacks with tender arms, too. They are raw and uninitiated, buoyed by the prospect of whatever comes next. They are freshmen. And they are the most important players on the field. Jason Shelley and Zach Wilson will lead Utah and BYU into action on Saturday night, neither having ever played in the rivalry game, neither knowing completely what to expect. This is an absolute first for each of them. And both Kyle Whittingham and Kalani Sitake are OK with it. Anybody who wants proof of that declaration should study Shelley’s 47-yard touchdown throw to Jaylen Dixon in the Colorado game. In what was at that point in the third quarter a tight contest, the quarterback dropped back a few steps and without hesitation fired a flawless spiral as Dixon was still clearing traffic. That play did not look like it was made real by an unseasoned passer, nor did an earlier 61-yard heave to Dixon that led to a second-quarter score. In two starts since Tyler Huntley was injured against Arizona State, Shelley has thrown for 483 yards and two touchdowns and run for another two scores. More significantly, he’s led the Utes to two of the most important wins since they joined the Pac-12. “You never know how someone’s going to react in a game. I did think [Shelley] would be poised. He’s always had good vision [in practice]. He’s always made plays with his legs. He’s been accurate. He did all those things on the big stage. Make it two-for-two, with a third chance directly in front of him. Shelley is undersized, listed at a mere 5-foot-11, 195 pounds, but he throws a nice ball and, as Taylor mentioned, sees the field well. It might be a bit early to make such judgments, but some believe Shelley runs Utah’s offense more deftly than Huntley did. (Trent Nelson | The Salt Lake Tribune) Brigham Young Cougars quarterback Zach Wilson (11) throws the ball away as he's brought down by Northern Illinois Huskies linebacker Kyle Pugh (57) as BYU hosts Northern Illinois, NCAA football in Provo, Saturday Oct. 27, 2018. 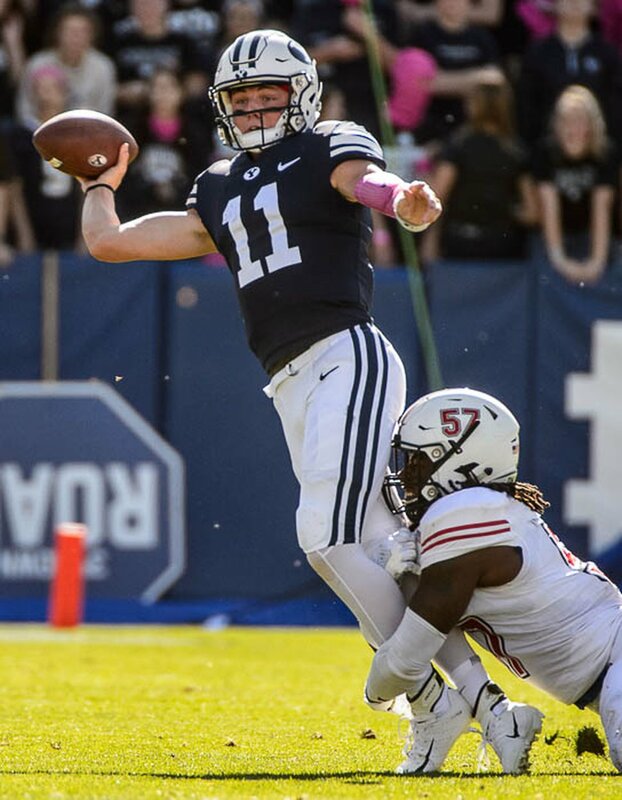 Wilson, since taking over as the starter at BYU at midseason, has benefited from playing weak opponents — Hawaii, UMass and New Mexico State — and struggled against Northern Illinois and Boise State. As Sitake said, he’s been far from perfect, although nobody would expect perfection from a teenage college quarterback doing everything for the first time. Wilson has a live arm, is mobile, and has the attitude — the mindset, as his coach put it — that is yet-unencumbered by the continued buffetings of failure. He seems to think anything is possible, and that’s mostly a useful notion. All told, Wilson has thrown for 1,057 yards with 82 completions on 135 passes, including six touchdowns and two interceptions. He’s making an attempt to fully command — and educate himself in — an attack that has periodically struggled through an undulating season. Moving into Saturday’s game, the biggest factor for both of the quarterbacks is the same that will determine the heights of their entire college careers — decision-making, poise and leadership. That’s a lot to require of freshmen, but the weight of the burden makes it no less true. Shelley has carried the load. Wilson has shown promise. Head-to-head, Shelley has a faster car to drive. He is surrounded by playmakers. Wilson must find ways to get everything he can out of what he’s got — fewer athletes. So far, the edge goes to Shelley. On both sides, on both counts, though, watching these young QBs establish themselves, discovering what their arms and minds can do, exploring the reaches of their capabilities, is a most fascinating aspect to this year’s rivalry game. Sitake and Whittingham are OK with it. They’ll have to be.